“Then, Now, and What’s Next?” Ruminations on Time and Technology | When I Survey . . . Originally a Navy man, Allingham was first assigned as a mechanic, and later a spotter, to a unit that carried out anti-submarine air patrols for the newly formed RAF. Keep in mind that the Wright brothers’ first flight had been launched as recently as 1903, so airplanes were just a decade old when the Great War broke out, and this would be the first significant use of them in war. 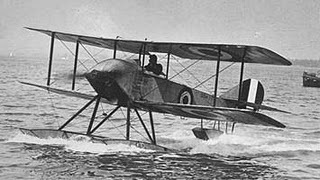 The Sopwith Schneider seaplane that Henry’s unit flew to look for German U-boats and other ships was really nothing more than a big box kite with an engine. It had to be lifted by cranes in and out of the water from a ship every time it went on a mission. The plane carried no parachute, no navigational instruments, save a map and a compass, no radio, only a carrier pigeon. To us it sounds primitive, yet at the time air flight was so new that it was cutting-edge technology. Today those fliers needn’t have risked their lives in reconnaissance missions. They could rely on satellites. The second man whose story I want to tell is my maternal grandfather, William Ira Laffoon. I only knew “Granddaddy Bill” when he was an old man, for he turned seventy the year that I was born. He was born on October 8, 1881, and when he was a boy of eight he traveled with his family from Missouri (“Missour-ah” is how he always said it) to Indian Territory on a Conestoga wagon to participate in the Oklahoma Land Rush of 1889. The Land Rush offered 2 million acres of free public land for homesteading on a first come first served basis. The rush, or “run” as it is more properly called, began at high noon on April 22, but many of the participants had already picked out choice parcels and hid on them until the official time. These were the “Sooners.” The ones who played by the rules and went when the cannon was fired were called “Boomers.” Unlike Rome, Oklahoma City, was built in a day, for there were over 10,000 inhabitants by late afternoon of the first day of the run. My grandfather and his family were the opposite of the “Sooners,” and waited until the next day to quietly go in to stake their claim, which is how my mother came to be born in Oklahoma City. Granddaddy Bill outlived both my mother and grandmother, and was still living on July 20, 1969, when he watched on his television set as Neil Armstrong of the Apollo 11 crew stepped onto the surface of the moon, exactly 80 years after the Oklahoma land rush. My grandfather died the following year at the age of 89. As a boy he could scarcely have dreamed of the changes that he would see in his lifetime, especially in technology. And it is hard to imagine anyone in previous human history experiencing in the span of one lifetime such technological development as he and others such as Henry Allingham did in the Twentieth Century. Yet, today we all live such lives, and increasingly so, as the time increments between world-changing inventions and innovations gets increasingly smaller and smaller, as if the world were somehow speeding up. Just think of the changes that have taken place in the generation since my grandfather died forty years ago. We are prone to think of the moon landing as the apogee of human achievement, but in terms of the history of technology it is from a time gone by. This was dramatically brought home to me when I watched that great 1995 Ron Howard movie “Apollo 13,” in which we see the space engineers in Houston making calculations on slide rules to bring the troubled ship home from the moon. When we watched it my children didn’t know what a slide rule was, since the pocket calculator, once a luxury item that now sells for next to nothing, had replaced it. And those big room-filling mainframe computers that sent the Apollo missions to the moon and back had less memory and file space than your laptop computer, or, for that matter, many iPods and cell-phones. We all live in a brave new world of dizzying technological innovation unthinkable even a generation ago. My ruminations on time and technology require pinning down what exactly is meant by “technology,” that big word with such a slippery meaning? The ancient Greek word, techne, is often translated as “craft or art.” Another Greek word, logos, is often translated as “word,” or “something said,” and by implication, “a subject of study.” Together they provide the roots for the word “technology,” literally “the study of craft,” to mean the knowledge and use of tools and crafts. It is this knowledge of the art of making and using tools that best defines technology. So in the span of human history technology begins with our ancestors’ use of simple tools, sticks and stones really, and continues through the developments of the ensuing centuries. Today our understanding of what constitutes “tools” has broadened to include all manner of using human knowledge to manipulate our environments, so that the term technology can be rightly used to describe work in genetics, medicine, biology, physics, and the like. I was reading yesterday in the Economist about the huge 15 billion dollar underground supercollider in Switzerland, which is expected to unlock some of the secrets of how our universe works to the physicists. It is a long way from stone tools to a supercollider but both are examples of humans using knowledge and tools to influence our environments, and so both are technology. One of the features of technological innovation is its reliance on what has gone before. One could use evolutionary theory in biology as a rough metaphor for the way technology develops. The invention or innovation that is more useful or efficient replaces what was used before, and seldom does a new breakthrough come about in isolation from the work of predecessors. For example, my grandfather’s family’s Conestoga wagon itself was the result of generations of accrued technological advance. Carpenters in Conestoga County, Pennsylvania, invented the clever tapered design that kept the thing from tipping over. Metallurgists had learned to fashion iron into the bands that covered the wheels. The wheels themselves were the result of an innovation first made in Mesopotamia in about the fifth millennium BCE, most likely for making pottery. 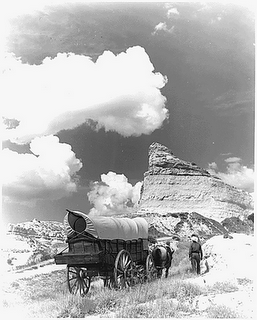 The horses that moved the wagon were the result of the domestication of the wild horse around the same period. The horse and wheel together revolutionized the way people could move from place to place, including conquests by traveling armies. As people traveled they learned new techniques and practices from those with whom they interacted, and a kind of technological cross-fertilization took place, to borrow another metaphor from biology. We take travel for granted, but for most of human history most people lived and moved and had there being within a few miles of where they were born. Changes in transportation technology changed all that. For example, Granddaddy Bill was born in Missouri, but at least according to family lore, his father Stephen was from Kentucky, and his people had been Huguenots, French Protestant refugees who had come to this country on sailing ships fleeing bloody religious persecution under Louis XIV. In 1889 the Laffoon family was on the move again. But how did they, and the other tens of thousands of Sooners and Boomers like them who headed West, even know about the Oklahoma Land Rush? Most likely from a newspaper, that now threatened technology. But how did the newspaper in Missouri find out about the Land Rush in Oklahoma? Most likely by a telegram, which was the result of the invention of the electric telegraph, developed by Samuel F.B. Morse in 1837. The invention of the telegraph is a good example of a new technology driving out an older one, for in 1861, when the wires for telegraphy were finally in place from coast to coast, the Pony Express, heralded just two years before as the great new advance in continental communication and mail delivery, was shut down for good. And so it goes. The story of one technological innovation supplanting another is not new, but what once took centuries, decades or years now can happen in a very brief time, as a quick look at some of the newest innovations that didn’t even exist at the turn of the millennium will show. As we have been seeing the story of technology has been going on for a very long time. What is new is the pace of its change, so much so that the technology of the last hundred years or so constitutes one of the great revolutions in human history. This rapidly accelerating pace of technological change in practically every aspect of our lives means that things we never dreamed of are now commonplace. To give some personal examples let me look at the way technological advances have impacted my own life. When I became the minister of First Church in 1982 I was only the eighteenth person to hold that position, parson Thomas Allen being the first in 1764. The basics of the job haven’t changed all that much, prepare and deliver sermons, preside at worship, oversee the workings of the institution, be a presence for the good in the community, visit the congregation, marry and bury and the like. Now I am not what is called an “early adopter,” the person that has to acquire the newest gadget as soon as it is available. I am more of a “that looks like a fun and useful thing and the price has come down” kind of guy. So I didn’t get my first personal computer until 1991, a Mac classic with 4 MB of memory, and only then because I enrolled in a doctoral program that required me to have one. So I am hardly a cutting edge technophile. Nonetheless, by virtue of my 22-year pastorate, which encompasses multiple generations of technological advance, I marked a number of firsts among the ministers of First Church. I was the first to use a word processor, a personal computer, a Palm Pilot, a cellular phone, a scanner, E-mail, a Power Point presentation, or an e-ticket to board an airplane to name a few. I was the first to have an MRI, orthotics in my shoes, a CD player, a VHS video recorder, a DVD player, a BluRay player, a digital camera, hearing aids with handless Bluetooth wireless capability to hear phone signals and music, a Global Positioning System in my car, an iPod, a video game, a digital picture frame, side airbags in my car, a Fast-Lane account. The list could go on and on, but you get the point. In my first ministry after ordination, in 1975, I served two small rural churches in Maine. There was no secretary so I ran off the Sunday bulletin on an ancient hand-cranked Liberator 500 mimeo machine. I would type the copy onto a flimsy blue stencil sheet with my manual Olivetti Typewriter, ink up the drum on the machine, attach the stencil, and then turn the crank as each copy came out. If I tore the stencil I had to start all over again, or try to repair it with a glue-like substance. I hated doing it and it often went undone ’til late Saturday night. In those days I wrote out my all sermons in longhand on 4 by 6 cards, later switching to 8 ½ by 11 inch sheets of Corraseable Bond paper made by the Shaeffer Eaton Paper Company in Pittsfield, long before I had ever arrived Pittsfield. That product was wonderful, allowing you to eliminated errors with a pencil eraser. But, to illustrate my earlier point, it was driven off the market by the advent of word processors and personal computers. By contrast I wote this paper on my 15 inch Apple MacBook Pro laptop using Microsoft Word. My first computer twenty years ago had 4 MB, this one has 2 GB, not even that muscular by today’s standards. I ran this paper off on my Hewlett Packer OfficeJet 6500 Three-in-One Printer/Scanner/Copier. Tomorrow I will send it to Martin as a file attachment in an e-mail, and he will post it on the Monday Evening Club blog. Which leads me to the next first for a minister of First Church of Christ in Pittsfield. I blog. Blogging is so new my spell-check underlines it every time I use it in a Word document. The term, short for Weblog, was only coined in 1997. Ten years later, the blog search engine Technorati tracked more than 112,000,000 blogs. There are certainly many more now. I have three. This one, my main one, “Retired Pastor Ruminates,” was started last March and is nearing the nine thousand visitors mark. I am also on Facebook, a social networking site that was launched on February 4, 2004 by a Harvard sophomore, and in that short six years is now approaching 400 million users. Through Facebook I have reconnected with old friends from high school and college, some of whom I have met face to face for the first time in decades. Through Facebook I have also found out about world and national breaking news events in real time, in addition to finding out quickly about a variety of personal news from friends, such as illness or death in the family. The widespread use of cell-phones with text-messaging capabilities is also changing the way the world works. Twitter, the microblogging and social networking service, was only launched in 2006. It limits users text-based posts, known as “tweets,” to 140 characters. Most tweets are mundane comments about what people are doing, but the social implications of such interconnectivity are breathtaking, and the immediacy of Twitter has made it a useful up to the minute communication tool. One study claims that blogs, maps, photo sites and instant messaging systems like Twitter do a better job of getting information out during emergencies than either the traditional news media or government emergency services. The study cites as an example, that Twitter, during the wildfires in California in 2007 kept their followers, often friends and neighbors, informed of their whereabouts and of the location of various fires on a minute by minute basis. Another example of the usefulness of Twitter is the 2008 Mumbai bombing attacks. Eyewitnesses sent out an estimated 80 tweets every five seconds, enabling the creation of lists of dead and wounded, giving out emergency phone numbers and the location of hospitals giving blood. Just a year ago, when US Airways Flight 1549 had engine failure from bird strikes and had to ditch in the Hudson River, a passenger took a photo of the downed plane with her cell-phone and sent it to Twitpic while people were still evacuating the plane and long before any media arrived at the scene. It was the first picture we all saw. Also last year NASA astronauts gave real-time reporting on Twitter of the Hubble Space Telescope repair mission. And the most recent example of a new use for text-based communication is the quick raising of tens of millions of dollars for Haitian earthquake relief using cell-phones. All this illustrates the power of the new information and communication technologies, and I think this is where the most stunning of the technological advances are right now and will be in the future. When Granddaddy Bill was born in 1881 he came into a world transitioning from an agrarian to an industrial economy and society. In the years he lived we had been gradually transitioning from the Industrial Age to the Information Age. Today we are squarely in the post-industrial Information Age, especially here in the West, but also in countries that are industrializing at the same time, such as China and India where cell-phones are proliferating exponentially. And there is a new dynamic at work in the Information Age. In the past, it was defense and the massive government spending that goes into research and development that often drove the technological innovation that eventually trickled down to consumers. A good example is the Internet, which began with researchers and the military. And the space program was a great hothouse for technological innovation. The now common GPS came out of such defense and space programs, although I have it on good authority that the ones we can buy are calibrated just inaccurately enough to make them ineffective for a terrorist to use as a guidance system for a SAM missile. But today, in a turn about, civilian technology is often being used by the military at a fraction of the cost it would take to develop it. The US Air Force recently bought hundreds of Sony PlayStation gaming platforms with the plan to link them together and make a supercomputer. And US snipers in Afghanistan are using an inexpensive iPhone application that aids in sighting targets, even calculating for the “Coriolis Effect” that allows for the earths rotation. This blurring of the lines between civilian and military uses for technology brings up another point for rumination about the way humans utilize the knowledge and tools they develop. We have already noted that the domestication of the horse was quickly utilized for military purposes, to carry chariots and cavalry. The satellites that circle our globe and make our GPS work are used as well by farmers in France to monitor sunlight and weather to improve crop yields. But they also are used in the kind of military surveillance Henry Allingham’s unit did in a seaplane, and today they help guide the Predator drones that target and kill terrorists (and sometimes civilians) in Afghanistan and Yemen. It is no accident that the Air Force ads aimed at potential young recruits look like video games. In the early Twentieth Century it was suggested by Hannah Arendt and Max Scheler that we might more properly be called Homo Faber, “Man the Maker,” than Homo Sapiens, “Man the Wise,” since it was our control of the environment through the use of tools that best characterizes us as a species. The term Homo Faber is from antiquity; the Roman Appius Claudius Caecus wrote; “Homo faber suae quisque fortunae” (“Every person is the fabricator of his or her own destiny”). Would Homo Faber be a more accurate name for us than Homo Sapiens? Our knowledge, as we have seen, is vast and ever increasing, but what about the wisdom to use it in a manner that enhances human dignity and freedom and the well-being of the created order? So I must leave it as an open question whether we have the wisdom to properly use our knowledge. But it is not a new question. The Tower of Babel story in Genesis suggests that the works of our hands can become idols when they seek to replace God as the highest good. So our technological feats, impressive in themselves, need to be understood within a loftier perspective. In my sojourns through Europe I have seen dozen of glorious cathedrals; great works of art crafted over generations by skilled workmen. These beautiful piles are not glorious by accident but by design. They were dedicated to the greater glory of God, their lofty spires pointing heavenward. They reminded those who saw them that the works of our hands take their place under larger and transcendent purposes. I wonder what check on human pride and vainglory holds today in a secular society entranced by its own inventions? These inventions, as we have seen, are marvels of human ingenuity and have enhanced the quality of human life for many, indeed most, of the peoples of the earth. But they come with a price. Granddaddy Bill grew up before the internal combustion engine and the widespread use of carbon-based energy sources. The automobile was one of the great technological advances in Twentieth Century life that he knew, but what he didn’t know, and we do, is that carbon gas emissions are threatening the well being, perhaps even the existence, of our planet, or at least our species. This threat represents the unintended consequences of technology. The hope is that we will develop new knowledge and tools to alleviate the problems we have created, and along with them, the wisdom to use them wisely. But we have seen that the will to deal with such concerns often lags behind short-term economic and political preoccupations. My Granddaddy Bill was a kind and gentle man with a dry sense of humor. A pious Midwestern Protestant he read his Bible every day, and riddled his conversation with biblical references. I never heard him exhibit any prejudice toward anyone, although like all of us, he must have had some. He was a learned man who loved books, although he had never gone to college. But both his daughters did, a rare thing for women in the 1930’s, and both went on to get Master’s degrees. Did age make these old men wise? I don’t know, but it is people like them who help me to remain ever hopeful for the future. At the beginning of this paper, I promised a look forward and here goes. What is in store for us? I am aware of the dangers, for predictions of the future are notoriously off the mark, from Edward Bellamy’s Looking Backward, Jules Verne’s futuristic fantasies, George Orwell’s 1984, Aldous Huxley’s Brave New World, and, of course, the Jetsons. Nonetheless, let me take the chance. In truth, I’ve already played my hand, for I see the same kind of serial innovation that has characterized the recent past continue unabated. But I see it speeding up, because of the interconnectivity of the information age. Global cooperation will speed the development of new products. My Apple computer, an American product, was manufactured in China with parts from Japan and other countries. There will be more and more of this, so that innovation now isn’t just collaboration with the past, but with a thoroughly connected global community. This will speed up innovation and also break down, but not eliminate, national boundaries and interests. It will also raise concerns about human rights and freedoms, the treatment of workers, and standards for environmental responsibility, as part of the cost of doing business globally. New technologies will continue to replace old ones. It is impossible to imagine all these changes, but I’m guessing that newspapers and network television are two that will not be around for long in their present form. I expect wireless technologies to increase, and I expect more and more information to be stored in and accessed from “clouds,” remote giant servers, rather than on personal computers, making limitations of file space and memory obsolete. I expect a revolution in biotechnology, one that is already taking place, with microbes that eat industrial waste and pollution. I see continued advances in agricultural technology that will help feed a hungry world, and in epidemiology and disease prevention and control, leading to the elimination of certain diseases. The mapping of the Human Genome will lead to many medical discoveries, and both diagnostic and surgical procedures will become less invasive and safer. I see information technology harnessed to create smart homes, cities and highways that lower energy cost and use. Green technologies in transportation and housing will save fuel use. Electronic highway passes (like EasyPass and Fastlane) will become mandatory for all drivers here from coast to coast within a couple of years, with a chip planted in your driver’s license. China, whose economy will surpass Japan’s this year as the second largest in the world, and ours in the not too distant future, will be the great engine of technological change in this century and beyond as it brings its millions into modernity. Along with these innovations will come challenges. One I have already mentioned, global warming. Will we have the knowledge and wisdom to fix the problems our own technologies have created? Another is the threat of terrorism, where advanced technology puts in the hands of the angry few the power to destroy the lives of millions. Here again, the cooperation of states is critical, as well as continual attempts by the global community and all people of good will to foster a world that leaves fewer and fewer people behind economically. And finally there remains the danger that technology will create new classes of “haves and have-nots,” as those without the access to these new technologies and the information that comes with it will be left behind. You would be surprised, I know, if I didn’t end by saying that religious faith will play a significant role in what happens next, and whether our technology ultimately helps us or harms us. The question for religious faith is whether it will be a toxic faith that fosters hate of the other, or a large-hearted faith respectful of the other, and committed to a path that leads to human dignity and freedom, and the well-being of the created order. Time will tell. This entry was posted in Communications technology, Information Age. Bookmark the permalink. >Rick, I enjoyed this tremendously. It brought to mind two technological connections to journalism that have affected, as you rightly say, the threatened technology of the newspaper. My first thoughts come from the work of Michael Schudson (2001, 2005) and Kevin Williams (2007) on the journalistic principle of objectivity. There has been a back and forth over whether straight, fact-based journalism was driven by the invention of the telegraph and wired news. In that theory, objectivity became paramount as the cost of using the technology meant more words, more money, the theory goes that wire stories had to be short and factual to be commercially viable. Schudson and Williams contend that there is more of a connection between objectivity and newspaper articles tied to the rise of the steam operated printing press. In short, as it became easier to print more content on more newspapers, newspapers sought to appeal to the widest audience by walking an impartial and more apolitical path. Thus, opinionated content fell by the wayside, and balance and objectivity became the high standard. Now, as we watch newspapers fall one by one, it has been the blogs, offering a mix of transparency and open opinion that have 'threatened' newspapers and their allegiance to objectivity. My second observation relates more closely to the role of newspapers. Benedict Anderson in his work 'Imagined Communities' (1983) tied the concept of a nation and the sense of national identity to shared symbols, driven by communicaiton, specifically the newspaper. The ability to communicate national news from border to border was brought about by technology, and provided people with a concept of their location within those borders. In this theory, because a newspaper whether in Anchorage, Alaska or Bangor, Maine carried a similar storyline it provided a national story, a narrative. In the 'shared ritual' of reading the daily newspaper in the morning (tied to and compared to prayer in Anderson's work) citizens of a nation had an impression of what was America, or more specifically, what was the American Nation. Beyond their own knowledge, though, they had the sense that others across the land were reading the same story. It was that knowledge and assumption that an entire nation is sharing in an experience and a knowledge set and narrative that the national identity is forged. With a shared cast of characters entering and leaving the discourse on a day to day basis, East to West, there was a shared sense of a national identity determined by the newspaper and shared by its readers. Thus, the nation is not a physical space, but an imagined community. This can be seen in the U.S. Colonies, when the loose set of individual states only united over shared national storylines (such as war and the shared common aggressors). When there weren't enough of these symbols, in the years preceding a federal currency, the sense of a nation was weak, while the sense of statehood was stronger. In other words: If there was no shared national news, or national story, there can be no concept or identity of a nation. The question now is, what impact is there on the sense of the nation if those media dissolve. Certainly there are national borders reinforced by national media online, but I wonder sometimes if that is because we are parts of transition generations who had a morning newspaper, and want some replicant of that online. There may well be in our youngest generations, or generations yet to come, people who won't require a sense of national news and a national news source, or news presented in a format that revolves around physical borders at all. There has already been evidence that people are now seeking their news by subject, not source, and by interest, not national relevance.